Ok, the “art and technique” of it all first. This was done on 9” x 12” 120 lb cold-pressed watercolor paper in mixed media, with altered image transfer (only the hookah-smoking caterpillar) which I redrew and painted, so little of the original image was left intact, and the rest is entirely my original work. 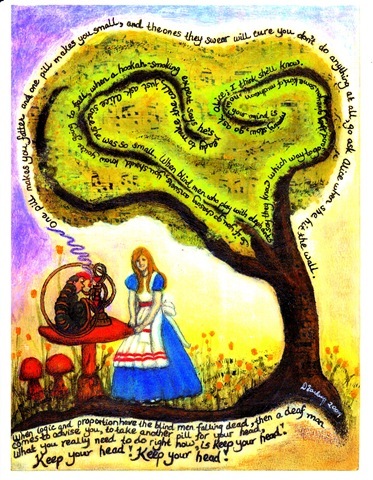 The tree was sketched and painted on a page of sheet music printed in reverse (intentionally part of the theme), which was collaged on, then further refined with the rest of the composition. This is the first time I have actually used this textured paper, mainly because I liked working on smooth paper with my other journal pages, but this paper was thicker and I needed something that could hold up to the heavy layers of media that I seem to apply, which had posed some difficulty with my previous pages, trying to put them on sheets of sketch paper (they buckled easily). This is the story of my life , pretty much since I “got pushed through the looking glass” somewhere around 5 years of age (when I fell off a gymnasium head first onto solid concrete and cracked my head), up to, and including the present day. I’ve been taken down more rabbit holes than I thought could happen in ten people’s lifetimes, and have been led down them by people who were entrusted with my care in one way or another–family, authority figures and, most of all, doctors and related professionals. The latest and longest one (medical), I discovered on my own, due to a misdiagnosis by a negligent doctor almost 20 years ago, which has caused irreparable damage to my body, personal and professional reputation, and self-esteem. What he prescribed, based on his misdiagnosis and what was accepted without question by every subsequent doctor, were his original diagnosis (which I have still not gotten hospital to remove from my record as inaccurate), and a long series of MANY drugs that I not only did not need, but I was allergic to each and every one of them. I shudder to think how many times I probably came close to my own death without knowing it, when I was not doing better, so they just kept INCREASING the dosage, without ever using their professional expertise to actually try to understand if someone along the way might have actually gotten it wrong. Yes, it is something that could actually have killed me. While I am damned lucky that it didn’t, I’m struggling with moving past how that has impacted me, now that I know the truth, and what consequences are still ahead of me, not to mention the deep sense of betrayal with the majority of the medical profession. I have lost count of the litany of surgeries that I have had to endure and the complications and permanent damage from those surgeries, all because someone screwed up a diagnosis, and scores of doctors to follow blindly followed that lead and made tons of wrong assumptions about what it meant. I am actually the one who figured out what was actually wrong with me, and took action on my own (I stopped taking any of these kinds of medications completely) and declared that such drugs were off-limits for me ever again and that problem is now corrected in terms of taking those drugs. The rest of it simply can’t be undone, and this journal is me processing those feelings. The words on the page are a rewrite of the Jefferson Starship song, “White Rabbit,” and someone who knows me really well will understand my reference to the recurring theme in my own life of dealing with “the blind men and the elephant,” and the “deaf man” telling me to take another drug for my head. Pretty much tells the whole story, and yes, “Alice” is a self-portrait.